Home > Media > Blog > Get Involved With The European Intentional Community (EIC) Open Day – May 2016! 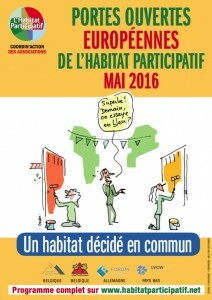 The UK Cohousing Network has been invited to join in the European Intentional Community Open Day in May 2016 with partner organisations in France, Belgium, Italy, Germany, Netherlands and elsewhere. This is an opportunity for existing cohousing communities to coordinate how they bring their vision and experiences to a wider audience and show the benefits of living within intentional communities. Participating groups would have a common open day on single or perhaps multiple days in May, to open their doors for would-be cohousers and interested parties to see cohousing in action. UKCN will help groups by providing promotional materials and information about the event and intentional community housing for re-use on member group websites and other media. The attached pdf document is a flyer, in French, to give a flavour of how this event is being promoted in other countries. We will put together similar materials for use in the UK. At the same time, being part of the EIC Open Day, is a reminder of the international dimension of our goals. We clearly share many of the same goals with our European neighbours for closer, more engaged and happier communities. It may be interesting to learn how the challenges and opportunities differ from country to country. For example, the French Government has recently passed new laws that make it much easier for the unique legal frameworks that intentional communities require to be recognised and accepted by financial institutions and other commercial organisations. These innovations may be something that we in the UK can learn from and can work with partner organisations, local and national government to achieve here. We at UKCN will be reaching out to individual groups very shortly to gauge interest in participation and we will share more information in the weeks leading up to the Open Day(s). Watch this space! The UK Cohousing Network Team.